Warning for the trades only readers - spoilers that contain information on Walking Dead #46!! The penultimate issue in the 'No-one is safe' story arc, Walking Dead #47 is a chaotic, bloody mess. In a good way. This issue does not mess around, it jumps straight into the action, taking up where we were left hanging at the end of #46. As Michonne takes the offensive, back at the prison Rick is dealing with the fall out of the brutal death of Tyrese. While Lori makes her feelings clear to her husband (she blames Rick for his inaction), he is again making clear to his son, Carl, what the emergency exit plan is. They are going to be needing it very soon. We then come to what I assume to be the climactic battle between Woodbury & the prison survivors. It's as disorientating, chaotic and brutal as you would expect, with Adlards art again delivering raw human emotion and explosive, bloody battle scenes. Major characters die again in this issue. There is a brief cavalry moment in the heat of battle that is all too quickly ended. The perimeter fences are finally breached, and as the likes of Herschel begin to put the escape plan into action, Rick rushes back to retrieve his family within the prison. The issue is over too soon (they always are with Walking Dead), and of course there is a massive cliff hanger, one of the best yet. 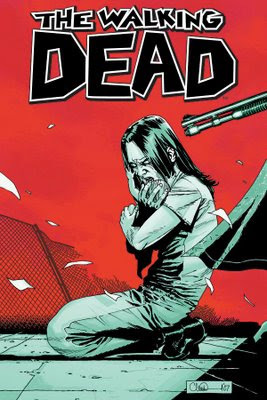 Robert Kirkman conitnues to surprise and delight with his ramped up storytelling, and Adlards scratchy art delivers all the emotion and action wonderfully. 'No-one is safe' is really living up to its promise. Where Kirkman takes us from here - who knows? There will be more suffering next issue, that's for sure.